Officially named the Golden Eagle Danube Express, the new luxury private train connecting Budapest, the capital of Hungary and Tehran, the capital of Iran embarked Wednesday, October 15, on its very first rail journey with 70 passengers aboard. An eclectic mix of modern era opulence, comfort and sophistication, rich history and timeless elegance, reminiscent of the iconic Orient Express which epitomized luxury train travel back in the 20th century, the Golden Eagle Danube Express is an authentic heritage train, 13 rail car long in all and pulled by a historic steam locomotive with a coal engine. Everything from the masterfully designed rail cars to the window curtains, furniture and even the staff’s uniforms harkens back to early 20th century. The luxury train is the brainchild of two British businessmen, Howard Trinder and Tim Littler. Trinder bought four rail cars from the Hungarian postal service and completely refurbished them into deluxe sleepers at a whopping cost of around $1.2 million. The lavish Tehran-bound private train is operated by the UK-based company Golden Eagle Luxury Trains, the world’s premier tour operator of long-distance, exclusive rail tours that include the celebrated Golden Eagle Trans-Siberian Express. Over the last 25 years, the British tour operator has pioneered unique, grand rail trips across Asia, Europe, North America and Africa. This deluxe train is the first European private train ever to be granted travel permit to enter into Iran, but the tour operator went to great lengths to achieve this, because in order to apply and secure the permit Golden Eagle had to set up an Australian affiliate to fight off sanctions against Iran. 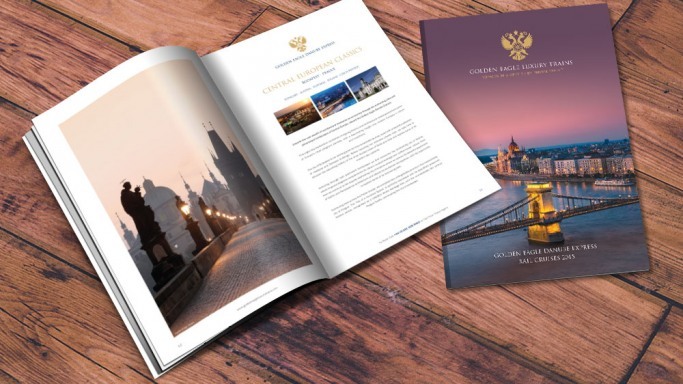 Exuberantly named ”Jewels of Persia”, the lavish two-week rail journey aboard the Golden Eagle Danube Express covers 4,350 miles across five countries ( Hungary, Romania, Bulgaria, Turkey and Iran) in two continents, Europe and Asia. Cruising in exquisite style and best-in-class comfort from Budapest on the banks of the Danube via the shores of the Bosphorus and the picturesque city of Istanbul into the historic and exotic land of Iran, ”Jewels of Persia” is a memorable, nostalgic and sumptuously rich trip into a bygone era associated with the decadence and opulence of a leisurely train ride. But settling back in the style of an era that defined luxury travel comes anything but cheap. The basic ticket costs $14,333, but if you really want to get pampered and leverage the maximum level of inclusivity provided by the British tour operator, then the new luxury train tickets can cost up to $40,000. In addition to luxurious and spacious sleepers, an elegant piano bar and private lecture rooms, this price also includes concierge service, artfully decorated private bathrooms, a comprehensive off-train excursion program and a fully inclusive, sophisticated dining experience with the finest wines and select dishes. Despite the seemingly steep price, all 70 tickets available for the very first ”Jewels of Persia” journey extravaganza sold out in as little as 10 days, according to Tim Littler, the founder of Golden Eagle, adding that luxury train trips typically sell for $1,000 to $2,000 per day and the price of this luxurious 2-week journey is clearly in that price range. The success of the deluxe Iran-bound train’s debut journey encouraged the market-leading tour operator to plan four more luxury trains to make the trip in 2015, the next one being scheduled for March.